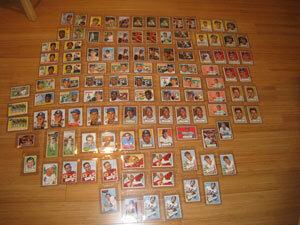 The sports card hobby is large and diverse. 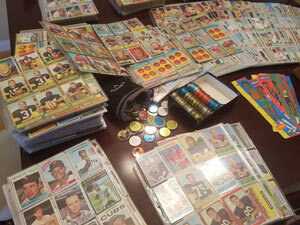 Collecting interests range from baseball cards to Pokémon cards, gum cards to postcards, autographs to unopened packs. 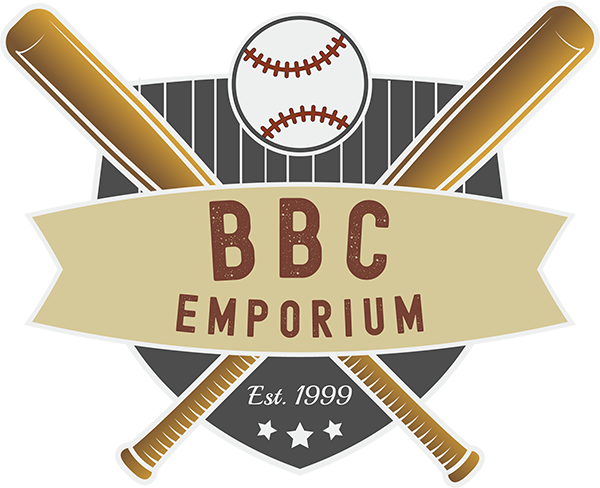 However, certain cards have transcended the hobby and are instantly recognizable to those within the hobby and even to many outside of the hobby. The 1952 Topps Mickey Mantle card is without doubt one of these cards. While the card is technically a 2nd year card, it is still the most sought-after Mantle card and most valuable card in the hobby. This iconic card not only portrays Mickey Mantle but comes from the scarce high series in the 1952 Topps set, which is the first and arguably most popular set that Topps has ever issued. Unfortunately, due to the cost and popularity of this card, it has attracted crooks and counterfeiters to the hobby looking to take advantage of unsuspecting collectors. This guide was written to educate collectors on the 1952 Topps Mickey Mantle card and equip them with the necessary knowledge to buy this card with confidence. Before we dive into the Mantle card, we first need some background on the set to provide some context. Prior to 1952, Bowman had a firm lock on the trading card market, however in 1952, Topps Chewing Gum Company of Brooklyn, NY, printed and distributed its first major baseball card set. Each series was printed on a 100-card half sheet. However, since less than 100 cards are in each series, some of the cards were double printed and showed up twice on the sheet. It is important to note that the Mickey Mantle card was in the 6th series and was double printed. We will look at this more in detail later, but the two different Mantles on the sheet contain minor variations. Below is an example of a partial sheet of the 1952 series. The first series was produced and sold first, but popularity didn’t peak until the second series was issued. By the time Topps got around to selling the cards from the 6th series, demand was very limited as it was late in the baseball season. 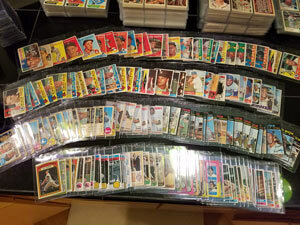 As hobby lore would have it, Topps was stuck with a large quantity of obsolete inventory from the 6th series and eventually loaded up the cards, hauled them out to sea and dumped them to free up warehouse space. While this story is the most commonly heard explanation, it is important to note that this has never been verified. It is also important to note that Topps’ quality control of cutting the cards was rather poor during this era. In today’s hobby, collectors seek after cards that are perfectly centered, however, most cards from the 50s and 60s suffer from centering problems due to poor sheet cutting procedures. The cards from the 1952 Topps set are no exception. Most cards that are found suffer from being off-center, miscut or diamond cut. This is an important point, as many of the counterfeit Mickey Mantle cards on the market show nearly perfect centering – which should raise a red flag. The “h” in Right and “s” in DiMaggio’s are nearly perfectly aligned. The “t” in Right and the “s” in DiMaggio’s are nearly perfectly aligned. Color – A lot of counterfeit cards will have display slightly different colors, hues and tints. Unfortunately, an authentic Mantle will also have slight variations as well, depending on how it was stored, exposure to light, exposure to UV, etc. While there are no specific things to look for regarding color, this is typically the easiest method to detect counterfeit Mantles if one doesn’t have the card in hand. Card stock – This is probably the most difficult part of the card for a counterfeiter to reproduce. 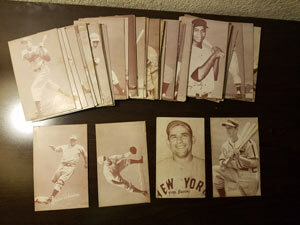 Buy a 1952 Topps common for a few bucks to get familiar with the cardstock. Counterfeits will often have a thinner cardstock or vary in texture and color. 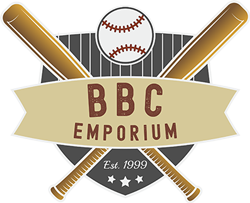 Wear – Few people will try to sell a counterfeit Mantle in pristine condition as 65-year-old cards will typically display wear. Often counterfeiters will try to tone or stain the card or artificially wear the corners to give the impression the card is old. Very often, artificial wear patterns are easy to spot. Black Light Test – Studying the color of fluorescence under a black light is another quick easy test to perform. This is a comparative test, so you will need some known authentic examples of cards from the set to compare to. The counterfeit may fluoresce darker, lighter or with a different color. Opacity – Testing the opacity of card stock is another good method to detect counterfeits. Different card stocks will differ on how much light they let pass through. If you have a strong flashlight, hold it up against the Mantle and then perform the same test on a known authentic example (or any card from the 1952 set) and compare the results. Below is a picture showing the test being performed on a 1968 Topps Mickey Mantle, but the same principle applies for any card. As the hobby moves into the future, very seldom are high profile cards sold ungraded, but rather are sold entombed in a tamper-proof holder from a third-party grader (TPG). The most well-known TPGs are PSA, Beckett, and SGC. PSA is the most well-known TGP and is a market leader. In the past, one could feel relatively safe when buying a graded card; that what they were buying was authentic and not altered. However, when it comes to high dollar cards, that is no longer the case. Counterfeiters have figured out how to compromise the holders by opening them, swapping out the cards or flips and resealing the holders again. The holders that are most commonly targeted are from PSA, which will be the focus of this guide. In the past years, PSA has made changes to their holders to prevent or minimize the fraud, but the older holders are still at risk. When examining a graded card, three things need to be examined – the card, the holder, and the flip (label). Since we’ve already covered the card in the previous section, we discuss the holder and the flip in this section. When a card gets sent to a TPG (third-party grader), they will assign a grade to the card and then entomb the card into a tamper proof case that is sealed via a sonic welding process. If the case is ever pried open, it will cause the edges of the holder to cloud up or “frost”. 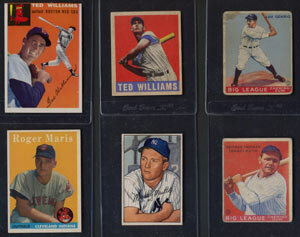 Here is an example of 1952 Topps Mantle that was opened on the right side and had a counterfeit example inserted. Note the frosting along the right edge as well as frosting on the top-right and bottom-right. Prior to 2013, PSA used a holder that was made up of two equally sized halves and joined by a sonic welding process. In 2013, PSA redesigned their holders to have two unequally sized halves, where one half would fit inside the other half before they were welded, creating a much more secure seal similar to the holder of Beckett. The newer style holder is much more secure and all cases of tampering that I’ve seen have been limited to the old-style holder. Another method to detect a counterfeit graded 1952 Topps Mickey Mantle is by examining the label or “flip” of the card. When these counterfeits are “produced”, the counterfeiter is cracking open a legitimate PSA holder, re-inserting a lower grade or counterfeit card and new homemade flip. The homemade flips will often contain the same certification number, barcode and grade, so simply checking the PSA database will not help in determining authenticity of the graded “card”. However, the homemade flips typically utilize very similar, yet slightly different fonts, character spacing and alignment than a PSA generated flip. By comparing these flip attributes to known good flips, one can also determine whether the graded card is counterfeit. One important thing to point out is that PSA has gone through several generations of flips, so it is important to compare same generation flips to draw accurate conclusions. Here is a brief history of the PSA flip that can be used as a guide, summarized from a Net54 thread. On the back, the “A DIVISION OF COLLECTOR’S UNIVERSE NASDAQ: CLCT” has been replaced with a QR code. Let’s look at some actual examples of counterfeits. We will start with some ungraded examples and then look at graded examples. As I noted previously, nearly every example I’ve ever seen of an ungraded 1952 Topps Mickey Mantle card that is being publicly offered for sale has been fake, so save yourself the trouble and avoid buying raw examples. This is another example that is relatively easy to spot but is a good example of how the card has been artificially worn. If you look at the surface and edges of the card, there is very minor wear. However, if you look at the corners, they have been smashed and show significant wear. Any card that has this much corner wear will also display signs of wear on the surface of the card as well as the edges. Below is a side by side comparison of the counterfeit and legitimate example of this 1952 Topps Mickey Mantle. If you look closely, you will see the difference in flip font. Here is another counterfeit example that came from the same seller as Example 5. As you can see, the same problem areas exist. Below is a side by side comparison with the legitimate version of this certificate number. While I won’t go into detail on each of these cards, I only include this example to show a batch of counterfeit cards that are getting ready to head to market. These counterfeited cards are not isolated cases, but unfortunately quite abundant. It is widely believed that a single group is responsible for making the fakes. The goal of this guide was to not scare collectors away from buying a 1952 Topps Mickey Mantle, rather to educate them to avoid falling victim to this fraud. Collectors are always looking for a good deal, but hopefully the point was made that when it comes to marquee cards, bargain shopping should be avoided. If you’re in the market for Mantle, I’d suggest only purchasing from reputable auction houses and dealers. The only holder and flip that I’ve yet to see successfully compromised is the PSA generation 10 lighthouse label. If you still have doubts or don’t feel qualified to judge authenticity of the 1952 Topps Mantle, I’d recommend that you only buy an example that is in this holder. The hobby is meant to be enjoyed but can be devastating if you fall victim to these crimes. Educate yourself and never get cheated.